Wilson Jones Loose-Leaf Phone and Address Book - 5.50" x 8.50"
Three-ring binder is designed to hold telephone, address and note pages. Included 80 sheets offer 1,600 entries with 10 entries per side. Soft green bond paper printed in brown and green ink reduces glare. Telephone/address book features a 1" capacity, round ring mechanism with opening and closing triggers, phone symbol on backbone, and a 25-division A-Z tab index. Tabs are stamped on both sides in gold foil. 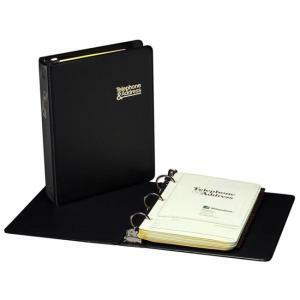 $20Wilson Jones Loose-Leaf Phone and Address Book - 5.50" x 8.50"
$21Rolodex Mini Classic 250 Card Rotary File Black 1.75" x 3.25"
$33Rolodex Open Classic Rotary File 500 Card Black 2.25" x 4"